We make it easy to have a private paradise in your backyard. We are a Design Build Pool and Spa Contractor that specializes in turn key construction. Showroom Hours: April-September: Mon-Thu 9:00-7:00, Fri & Sat 9:00-5:00, Sun 10:00-2:00. October-March: Mon & Thu 9:00-7:00; Tue, Wed, Fri & Sat 9:00-5:00; Sun-Closed. 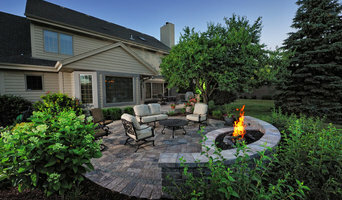 One of southeast Wisconsin's foremost award-winning design/build landscape developers, LandCrafters brings exceptional creativity to custom crafting new and renovated landscapes precisely to your tastes and desires. From small, simple renovations, to large, complex estates, our team of landscape architects and designers excels, managing your entire project or as a member of a larger project team. Each client receives the same superior service, and every project benefits from our impeccable craftsmanship and utmost attention to detail. Since 1977 the professionals at Wandsnider Landscape Architects & Construction have listened, designed, constructed and managed quality landscapes throughout Southeastern Wisconsin. With an average of 20 years of foreman experience, we are experts in all phases of the architectural process. We provide all of the services and quality you expect. Fire, Water, Stone .... elements we use to create outdoor spaces families love to live in. Whatever the size of your yard, Terra Yard Creations will turn your under-utilized exterior space into the favorite room in the house! From simple stone walkways to complete outdoor living spaces, we not only have more selection, we'll handle your project from design thorough installation. At Terra Yard Creations, we help homeowners get the most out of their investments by turning under-used portions of their yards into true outdoor living spaces. We offer complete selection of outdoor design products and services, from simple stone walkways all the way up to complete, custom-designed outdoor kitchens. Whether your goal is to entertain friends and family, or simply relax and get a little closer to nature, Terra Yard Creations is your connection to the finest in outdoor living! We design and build outdoor living spaces featuring inground pools. We cater to consumers that value the importance of design along with top of the line construction methods. No short cuts here. Consumers also benefit by dealing with one contractor and receive one price to build their own "Land of Ahhhs." If your considering an inground pool for your backyard- you need to have a plan that will complement and add value to your home. Give us a call today to discuss your project. For over 25 years, Earth Developments has created exceptional, elegant outdoor environments for their clients. As a full-service design build firm, we are fully-equipped to design, install and maintain your home, from an intimate patio and garden to a large scale estate. We believe in relationship-based success. It is our relationship with clients, combined with a history of design excellence, understanding of our client’s desires, along with our professional staff, that has allowed us to emerge as one of the top design build firms in the Chicago area. Nelson’s HomeTowne Recreation is a family owned business started by DuWayne and Nancy Nelson. Duwayne has over 39 years of experience building swimming pools, making him an expert in the field. Nelson's can help you turn your backyard into your family's dream vacation spot, whether you are looking for an inground swimming pool, semi inground pool or above ground pool, spa, or sauna. Nelson's also carry a full line of game room items including Billiards, Darts, Air hockey, Foosball, Poker items, Furniture as well as Massage Chairs. Nelson's would love the opportunity to earn your business!. Come by our showroom, located in Janesville, WI. We are a full-service pool design, swimming pool construction, pool renovation, remodeling, maintenance and repair swimming pool company, serving homeowners in Waukesha, WI. We offer vinyl liner and one-piece fiberglass swimming pools, along with spas, custom water features, and designer concrete patios. We make every effort to give you the type of pool that ‘you’ want, not the one that someone is trying to ‘sell’ you. The Ground Crafter is a full service landscape design-build firm specializing in unique outdoor living solutions. Clients can expect thorough and exciting design development, collaborative project management and custom workmanship throughout the project. We have a proven skill level that is necessary for advanced projects, many of which have been honored in award-winning reviews. Our staff members are “design thinkers”. Our crew leaders are talented, solution-oriented and true craftsmen. The Ground Crafter mission is to create healthy and beautiful environments that enhance the quality of life. When it comes to your landscape, we believe this decision should be considered as carefully as your other investments to ensure that it, too, is protected and grows in value over time. Understanding your personal tastes, budget and how you'd like to use your outdoor space will allow us to create your perfect landscape. Our team is passionate and experienced, and our crews are skilled, neat and polite. ( That's important to us! ) Our ability to serve all of your landscape needs — including construction, maintenance and seasonal color, to name a few — makes life easier for you. We hope you'll pause and get to know LandWorks a little better before you select your landscaping partner. We'd like the opportunity to meet you, and show you how we're different. Notable Landscape Architect/Consultant with over 38 years experience in design and installation oversight ranging from high-end, classical and contemporary to native lands restoration. Most recognized for unique conventional landscape design approach utilizing locally-sourced materials and native plants. While my landscape design has been strongly influenced by the traditional architecture prevalent on the North Shore of Chicago, and of which any good landscape architecture is meant to compliment-I have always been especially passionate about the natural world. Promoting a healthy environment and richer outdoor experience by including plants that attract wildlife such as song birds, butterflies, and pollinating insects, etc, back into the landscape has always been part of the “program”. Recognizing that we are presently experiencing the most critical decline in native wildlife populations ever recorded, primarily due to habitat loss-and my potential for championing positive change-has prompted me to leave my family business and found my new company: LandServe, LLC...“Landscapes for life!”. Through ‘LandServe’ I have the opportunity to promote a unique “hybrid” design approach for “true”, long-term sustainability: landscapes with “widely accepted visual appeal”, while also utilizing native plants and other locally resourced materials. By creating landscapes which meet the client’s needs for function and aesthetics, I’m able to make my case for including native plant species in literally all landscapes and land developments, of any scale or style! As such, both the needs of my client and creature are served! I brought my own special skill sets to bear in helping create the largest privately-held residential landscape company in the country. I understand the enduring legacies that will stand the test of time are not only the many landscape designs that I’ve created in the past, but more importantly, the healthier, environmentally responsible landscapes I am providing now as I lead my new company - LandServe, LLC - into the future. Flagstone expertise in creating beautiful landscaping to produce incredible designs to match the environment around. 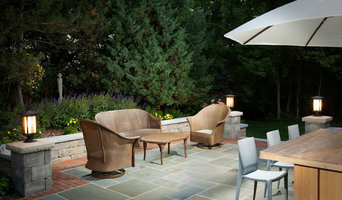 At Flagstone, we create customized outdoor environments utilizing an array of high-end and natural elements. From patios to pools and everything in between, we aim to perfect your environment, which is why we're intimately involved in each project from the very first sketch until the final stone is in place. A landscape design studio that creates quality, comprehensive landscape plans with the clients best interest always in mind.